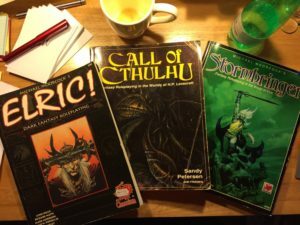 5 years ago I made my first post here on Department V.
To celebrate 5 years of blogging I’ve revised, edited and expanded my Elric of R’lyeh setting. You can grab the pdf here. Moving forward, I’m going to update the site over the next few weeks to simplify the pages and consolidate downloads. None of the content is going away. And after that, something new. Watch this space!